Not many people in Berlin are familiar with Hallesches Tor and Mehringplatz (Mehring Plaza). A few might recognize it from the U-Bahn station, where you can transfer to the U6 or U1. Others might know that you're supposed to avoid walking through the residential complexes at night in order to avoid the drunks who hang around most of the day. And those residential buildings? They're not exactly stunning by modern architectural standards. A circular residential building. The complex consists of an inner circular building and then a series of outer buildings. This being Berlin, I knew that there was probably a cool story behind the buildings and the inner plaza. The buildings were definitely built post-war. But how long had the plaza been there? Who was living there now? And as I slowly learned German, I knew that "Tor" meant "gate". But a gate to what? And what the heck is Hallesches? Another apartment tower. Not the prettiest thing you've ever seen, right? 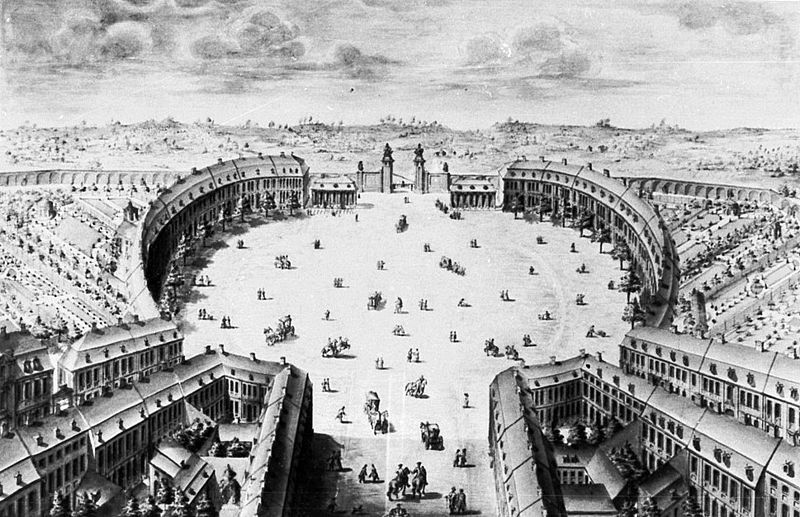 Hallesches Tor and Mehringplatz in 1750, looking towards the south. Source. Hallesches Tor and Mehringplatz were constructed in the 18th century, during the time of Frederick the Great. It was, literally, a gate towards a city called Halle. Back then, cities had walls all the way around them, which they closed at night to keep out ruffians and, I suppose, invading armies. In the picture on the left, you can see the gate at the far end of the photo. The city walls extend to the right and left. Halle still exists, by the way, and is located about 170 kilometers south of the city. So the Hallesches Tor was a gate towards Halles. That makes sense, but where's the gate now? The Gate's claim to fame, in my opinion, is that it was the gate through which Napoleon and his armies entered, and eventually exited, Berlin during the Napoleonic Wars. Not every gate can say the same thing, ya know? Eventually Berlin expanded and grew past Mehringplatz, so the actual gate was no longer needed. It was demolished in 1870, but retained the name. The area around developed into a firmly middle class neighborhood. There was even a weekly market held in Mehringplatz through the middle of the 19th century. Hallesches Tor in 1894. The gate has been replaced by an open street entryway. Source. 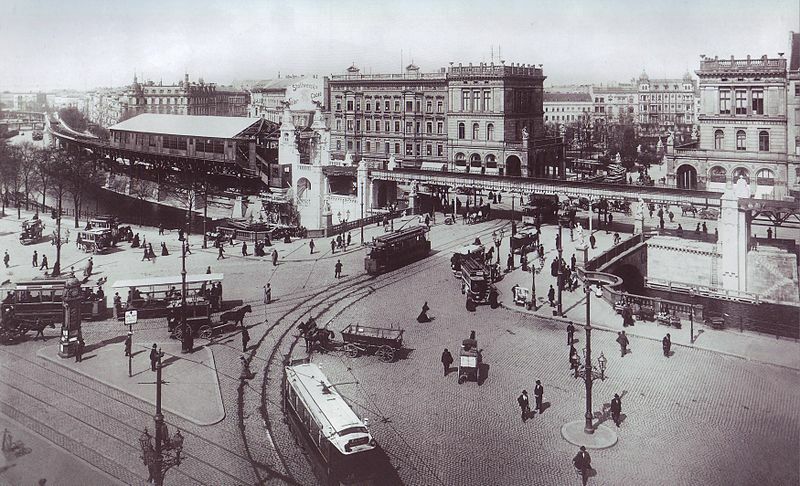 By the end of the 19th century, Hallesches Tor was a bustling residential and commercial district. In 1901, a train line and station was erected that today is the U1 Hallesches Tor stop. The train station still exists and looks exactly like it does in that photo. Hallesches Tor with the newly constructed train station. The station still exists, and is one of the oldest in the entire Berlin U-Bahn system. Source. We all know what comes next. On February 3, 1945, American bombers launched an air raid on the area in and around Hallesches Tor. Their goal was to destroy the bridges across the Landwehr Canal, one of which you can see in the above photo. The raid was successful, and the bridges were destroyed in anticipation of the Soviet land invasion that would arrive a few months later. In addition to the bridges, many of the buildings in the vicinity were destroyed or heavily damaged. By the 1950s, the area had been completely demolished. The modern buildings that we saw in the first few photos above were built in 1968 by the architect Werner Düttmann. Hallesches Tor was re-imagined as an area for government-subsidized housing, complemented by keeping Mehringplatz as a pedestrian-only zone. The housing units are still heavily subsidized, and discussions are currently being held between residents and city officials about what can be done to rejuvenate the area. The past wasn't completely erased, though. While taking a few photos for this blog post, I walked past a row of pillars at the entrance to the housing complex that seemed strangely out of place. They weren't connected to any buildings, and had a few pockmarks that are often war damage. Pillars that looked out of place. Were they made out of marble? Notice the pink building in the middle of the illustration. In the foreground is the U-Bahn station. Source. In the illustration on the left, from 1916, you can clearly see rounded pillars on the ground floor of the building in the center. There are more pillars in the illustration than there currently are, but it's possible that they could have been destroyed and then removed. The pillars that I found are in exactly the same position as in the illustration above: directly across from the bridge, and at a slight cross angle from the station. It seems likely that the pillars in the above photo are all that remains of the building in the center of the illustration. Not only that, but the pillars are the only remaining remnant of all the other buildings in that photo. An entire neighborhood was wiped out, its residents scattered and its architectural legacy destroyed. In Berlin, this is a story that can be told over and over again. Over the years, countless lives were lost or upended. Neighborhoods and their unique rhythms and histories were lost and forgotten. 20th century Berlin was in many ways a blank slate for politicians, planners, and new residents. New buildings appeared, and new histories were written. It's worth remembering, though, what was there before. Cracked facades, empty lots, broken pillars: they are remnants of a bygone era, and remind us yet again how the past is never completely past. The park inside the ring of buildings. The memorial in the center is currently being refurbished. Newer Posthy!, how are you?